Here is a charity shop find that I'm very pleased with. It is the Lord of the Rings Oracle, by Terry Donaldson. Terry was a brilliant tarot teacher and the creator of several tarot and oracle sets as well as being the author of books including Step by Step Tarot. He was also a friend of mine, before we lost touch in the 1990s. I later learnt that he died a few years ago in rather mysterious circumstances, which is very sad. I'm looking forward to trying out this oracle set - which includes cards, a map and a replica of the One Ring. 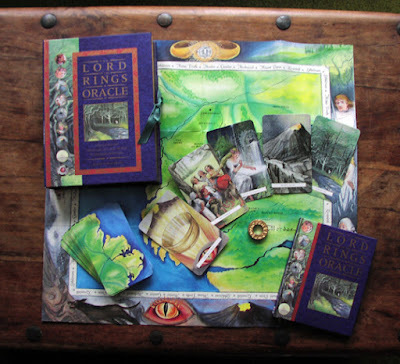 The Lord of the Rings Oracle can be ordered via Amazon.